Michael Scott "Mike" Lieberthal (born January 18, 1972), nicknamed Lieby, is a former Major League Baseball catcher. He batted and threw right-handed. In a 14-year career, Lieberthal played for the Philadelphia Phillies (1994–2006) and the Los Angeles Dodgers (2007). He compiled a career batting average of .274, with 150 home runs and 610 runs batted in. During his career he won the Gold Glove Award, and was twice an All Star. His 1999 season (.300, 31 home runs, 96 RBIs, Gold Glove Award) was arguably the best ever of any Phillies catcher, and he caught more games in his career than any other Phillies catcher (1,139). His career 149 home runs at catcher were the most in team history. Lieberthal had a .310 batting average, a .381 on-base percentage, and .510 slugging percentage lifetime against left-handed pitching. He was inducted into the Philadelphia Baseball Wall of Fame on August 10, 2012. Lieberthal was an all-American catcher at Westlake High School, and graduated in 1990. Lieberthal hit four home runs in a single game for his high school: (1) a single home run, (2) a 2-run home run, (3) a 3-run home run, and (4) a grand slam. Immediately after that game, Lieberthal's team was ranked among the top 3 high school teams in the United States by USA Today, and advanced on that list to #1 a few days later. Lieberthal was drafted by the Philadelphia Phillies in the 1st round (3rd overall) of the 1990 Major League Baseball Draft, despite weighing only 155 pounds at the time. Lieberthal played in the minor leagues from 1990–1995. He played for Martinsville in 1990 (Rookie League), Spartanburg ("A"; for which he batted .305) and Clearwater ("A+") in 1991, Reading in 1992 ("AA"), and Scranton/Wilkes-Barre from 1992 to 1995 ("AAA"). He made his major league debut on June 30, 1994, at the age of 22 as the starting catcher against the Los Angeles Dodgers. He recorded his first career base hit in the 4th inning against Pedro Astacio. On July 16, 1994 he hit his first home run off of Ramon Martinez in the 3rd inning of a 10–6 Phillies victory against the Dodgers. In 1996, he had surgery for torn cartilage in his left knee. In June 1997, he won Player of the Month award after batting .400, but his season was shortened by a pelvic stress fracture injury. In 1998, he hit .339 in games that were late and close. In 1999, he hit 31 home runs and 96 RBIs for the Phillies, while hitting .300 with a career-best .551 slugging percentage. He hit .377 against left-handers, and was 8th in the league with 8 sacrifice flies and 11 HBP. He was an All Star for the first time, only the second Phillie catcher ever to receive the honor (joining Bob Boone). He also won a Gold Glove Award, after posting a .997 fielding percentage—a new Phillie record at catcher. He joined Johnny Bench, Lance Parrish, and Ivan Rodriguez as the only catchers to have hit 30 home runs in the same season that they won the Gold Glove Award. He also became the eighth major league catcher to bat .300 and hit 30 homers in the same season. He also became the first Phillie to bat .300 and hit 30 home runs since Greg Luzinski, in 1977. In 2000, Lieberthal was again an All-Star, and hit .350 against left-handers. A play at the plate involving a collision with Bernie Williams resulted in an ankle injury that knocked him out for the rest of the season. In September 2000, he had surgery to remove a bone spur in his right elbow. 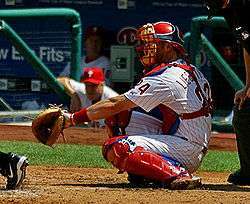 In May 2001, Lieberthal was picked off at first base and tore his ACL and MCL and cartilage in his knee while attempting to dive back to the bag. He had surgery in June, and missed the rest of the season. In October 2002, he injured the same knee as he stepped out of a golf cart near his home. He tore the meniscus, and had surgery. In 2002, he was 5th in the league in HBP (14), and batted .346 against left-handers. He was the Sporting News NL Comeback Player of the Year, the first catcher to win it, and also was a co-winner of the Player's Choice NL Comeback Player award. In 2003, Lieberthal hit .313 (12th in the NL), and was 8th in the league in HBP (12). In 2005, he was 6th in the league with 14 intentional walks, and struck out only 35 times, while walking 35 times. In 2006, Lieberthal batted .310 in games that were late and close. He left as the Phillies' all-time catching leader in home runs, RBI, and games caught. Ironically, despite his excellent work behind the plate during his tenure with the Phils, every season he played for the Phillies, they never made the playoffs, but the year before (1993) and the year after (2007) his time with the Phils, they made the playoffs. Lieberthal signed as a free agent with the Los Angeles Dodgers on December 6, 2006. He received a $1.15 million contract, with a club option for 2008. He made more money than the Dodgers' starting catcher, All-Star Russell Martin. After playing in only 38 games in 2007 and hitting .234, Lieberthal's $1.4 million option was not picked up by the Dodgers, who instead bought out the contract for $100,000, and he became a free agent on October 30, 2007. In January 2008, Lieberthal announced his retirement. "I'm done," Lieberthal said. "If [the Dodgers] had picked up my option, I probably would have played 1 more year. But I didn't want to go anywhere else. There were a lot of reasons. The money was great as a backup, but I have made [enough] money in baseball. I just didn't want to go through what I have to go through with my body to play 20–25 games a year. It's not worth it." It was suggested that while it was unlikely that Lieberthal would choose to coach, enjoying golf and married life for the immediate future, he had expressed an interest in being a television analyst. In 1996, he threw out 36% of runners attempting to steal. In 1997 he allowed only .64 steals per 9 innings, 3rd-best in the league. In 1999, Lieberthal led National League receivers with a .997 fielding percentage. Lieberthal caught Kevin Millwood's no-hitter on April 27, 2003. On April 28, 2008, Lieberthal announced that he would sign a one-day contract with the Phillies on June 1, throw out the ceremonial first pitch and then officially retire. He would be the first Phillies player to retire in the same manner since Doug Glanville in 2005. Lieberthal appeared in the motion picture Summer Catch in 2001 alongside teammates Doug Glanville and Pat Burrell, as well as fellow major league baseball stars Hank Aaron, Ken Griffey, Jr., and Dave Collins, among others. A bobblehead of Lieberthal is seen many times in scenes of the show The Office. From 1998, he sponsored "Lieby's VIPs," in which he purchased $30,000 worth of tickets for children with cancer, and their families. In addition, he treated the children to a Halloween party. He served as 2000 Chairman of C.A.D.E. 's (Corporate Alliance for Drug Education) fundraising drive. Beginning in 2001, he co-hosted a celebrity billiards tournament, with Doug Glanville and Randy Wolf, to raise money for the Philadelphia Futures mentor program (since 2001, the event raised over $325,000 for the Futures program). Through 2010, Lieberthal had hit the 5th-most career home runs of any Jewish major league baseball player, behind Hank Greenberg, Shawn Green, Sid Gordon, and Al Rosen, and was 7th on the all-time list in hits (behind Gordon) and RBIs (behind Rosen). Lieberthal's father is Jewish, and he is considered Jewish by Reform Judaism, and is also listed as such by the American Jewish Historical Society and others. The next Jewish player for the Phillies was Michael Schwimer, who debuted in 2011. When it was pointed out to Lieberthal that he, Brad Ausmus, and Jesse Levis, were all catchers, and that Jewish kids were thought to be smarter than to subject themselves to the rigors of that position, he responded with a smile: "We are smart. You don't have to hit to catch. We don't have to hit 40 homers. We don't have to run. We don't have to steal bases. All you have to do is catch, and you'll be in this league forever. We get beat up a little bit, but it's the quickest way to the major leagues." ↑ "Mike Lieberthal Baseball Stats". Baseball Almanac. Retrieved January 23, 2011. ↑ David J. Goldman. Jewish Sports Stars: Athletic Heroes Past and Present. Retrieved March 14, 2011. ↑ Rich Westcott. Philadelphia Phillies Past & Present. Retrieved March 14, 2011. ↑ Eric Karabell. The Best Philadelphia Sports Arguments: The 100 Most Controversial, Debatable Questions for Die-Hard Fans. Retrieved March 14, 2011. ↑ "Mike Lieberthal Career Batting Splits". Baseball-Reference. Retrieved January 23, 2011. 1 2 3 4 5 6 7 8 9 Joe O'Loughlin. "Mike Lieberthal; Phillies' Leader Behind the Mask". Baseball Digest. Retrieved March 14, 2011. 1 2 3 Jon Caroulis. "Catching On; Mike Lieberthal Improves his Game Behind the Plate". Baseball Digest. Retrieved March 14, 2011. ↑ Jeffrey Wayne Maulhardt. Baseball in Ventura County. Retrieved March 14, 2011. 1 2 3 4 5 6 Robert Gordon. Legends of the Philadelphia Phillies. Retrieved March 14, 2011. 1 2 Ames, Steve (January 4, 2007). "Lieberthal returns to his roots". Theacorn.com. Retrieved January 23, 2011. ↑ Ken Mandel (October 17, 2002). "Lieberthal recognized for comeback". MLB.com. Retrieved January 23, 2011. ↑ Rob Trucks. The Catcher. Retrieved March 14, 2011. ↑ Martin Abramowitz (March 30, 2007). "The boys of summer and seder: Baseball, Passover share openers". Jweekly.com. Retrieved March 14, 2011. ↑ Ken Gurnick (August 25, 2007). "Dodgers decline options on two players". MLB.com. Retrieved January 23, 2011. ↑ "Dodger Inside Pitch". Scout.com. October 27, 2007. Retrieved January 23, 2011. ↑ Archived April 6, 2008, at the Wayback Machine. ↑ Ken Mandel (December 8, 2008). "Coaching future for Lieberthal?". MLB.com. Retrieved January 23, 2011. ↑ "Retrosheet Boxscore: Philadelphia Phillies 1, San Francisco Giants 0". Retrosheet.org. April 27, 2003. Retrieved January 23, 2011. ↑ "Lieberthal to retire with Phillies". Yahoo! Sports. April 28, 2008. Retrieved January 23, 2011. ↑ "Jewish Major Leaguers Career Leaders". Jewishmajorleaguers.org. Retrieved January 23, 2011. ↑ "New exodus: Jewish players in '07", JTA Archived March 12, 2007, at the Wayback Machine. ↑ "Jewish Baseball Players". Baseball Almanac. Retrieved January 23, 2011. ↑ Craig Muder (August 30, 2004). 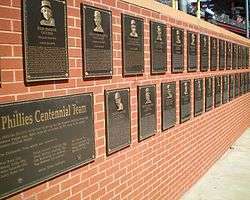 "Hall of Fame celebrates Jewish players". Reds.enquirer.com. Retrieved January 23, 2011. ↑ Al Doyle. "Shawn Green Emerges as All-Around Star for Blue Jays". Baseball Digest. Retrieved March 14, 2011. ↑ Bill Francis (August 30, 2004). "Jewish players celebrated at Hall". MLB.com. Retrieved March 14, 2011. ↑ Randy Miller (August 19, 2011). "Don't expect much from Phils at next trade deadline". phillyBurbs.com. Archived from the original on September 3, 2011. Retrieved August 22, 2011. ↑ "Matt Kamine Named to Jewish Sports Review All-America Baseball Team". CSTV. July 19, 2007. Retrieved August 21, 2011. ↑ Ron Kaplan (August 18, 2011). "One man's ceiling is another man's floor". New Jersey Jewish News. Retrieved August 21, 2011. ↑ Scott Barancik (August 17, 2011). "Newest MLB Jew: Phillies call-up reliever Michael Schwimer". Jewish Baseball News. Retrieved August 21, 2011. ↑ Murray Chass (July 18, 1999). "Umpires Taking Huge Gamble With Threats". New York Times. Retrieved January 23, 2011.